Eyewall takes you on a dramatic ride into the eye of a major hurricane and the lives of the people who challenge it. Major Arlen Walker is on his final mission with the Air Force Hurricane Hunters. As commander of a WC-130, he’s been tasked to recon Hurricane Janet just off the Georgia coast On paper, the flight looks like a milk run. In reality, it turns out to be anything but. Walker, having been briefed that the hurricane is weak, penetrates the storm hat low altitude. Too late, he realizes Janet has turned savage and that he’s chosen a death wish flight level. The hurricane pummels the plane. The aircraft, spewing fuel, limps into the calm eye but is so severely damaged, Walker cannot fly it out. 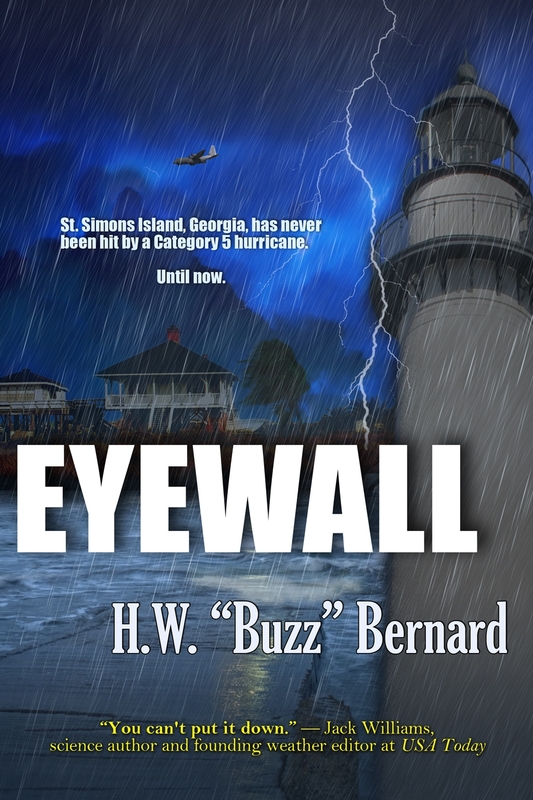 He and his crew are trapped in the center of a catastrophic storm as it swirls toward the mainland. A crippled Air Force recon plane, trapped in the eye of a violent hurricane. An outspoken tropical weather forecaster, fired from his network TV job before he can issue a warning: the storm is changing course and intensifying. A desperate family searching for a runaway daughter on Georgia’s posh St. Simons Island, cut off from escape as the hurricane roars toward them. A marriage on the rocks; an unrequited sexual attraction; a May-December romance. All will be swept up by the monster storm. Get ready for a white-knuckle adventure.